Brandon Mull is the New York Times bestselling young adult author of the Fablehaven series (Fablehaven, Rise of the Evening Star, Grip of the Shadow Plague, Secrets of the Dragon Sanctuary, and Keys to the Demon Prison), The Candy Shop War, and Pingo. He is well known for visiting over 600 schools. Matthew Peterson: You’re listening to The Author Hour: Your Guide to Fantastic Fiction, which can be found at www.TheAuthorHour.com. I’m your host Matthew Peterson, author of Paraworld Zero, which some reviewers have compared to Harry Potter, Star Wars, and Artemis Fowl. My next guest is Brandon Mull, New York Times bestselling young adult author of the Fablehaven series, The Candy Shop War, and Pingo. Thanks for being on the show today, Brandon. Brandon Mull: Happy to be here. Brandon Mull: [laughs] I do a lot of school visits, and Utah’s close to home for me, so especially in Utah. Matthew Peterson: Do you know how many schools you’ve visited so far? Brandon Mull: Something like 650 schools in 30 states. Matthew Peterson: Oh, man! Yeah, Obert Skye told me something close to that figure as well. [laughs] That’s crazy! Brandon Mull: Yeah, yeah. Heavy, heavy grass roots, get out in front of people, talk to people kind of marketing. Obert Skye’s from Shadow Mountain, where I’m from as well. Matthew Peterson: Were you setting up all these appointments? Or you have help from your family, too, don’t you? Brandon Mull: Well, my sister was hired by the publisher for a time. Brandon Mull: To help with my touring. But it’s all been the publisher. My sister was paid by the publisher to do it. Matthew Peterson: Oh! I did not know that. See, I was telling my wife... ‘cause I heard that your sister was setting up appointments and you were on the road. And I’m like, “Look, his sister’s helping him! Man, I got a lot of brothers, I wish one of them would help me.” [laughs] But ah! She was getting paid. That changes things. Brandon Mull: Yeah, yeah. It was actually a job for her. Even though, I mean, I don’t think she was getting paid what she was worth. Brandon Mull: She was partly doing it as a favor. Matthew Peterson: Yeah. Well, that’s great to have that support there. Well, what got you started in writing the Fablehaven series? Brandon Mull: Fablehaven itself was... I used to live in Connecticut, my house was surrounded by trees. Sometimes I would daydream, “What if there were weird creatures out there in the woods?” Which led me to think of, “What would be an excuse for magical creatures to live in our world?” And the excuse I came up with was, “What if there were these secret wildlife parks?” Secret wildlife refuges for magical creatures that had been hidden away over the ages where they’re watched over by human caretakers. And that premise became sort of a playground in my head and grew into the Fablehaven series. It was probably the Narnia books, as a kid, that kind of got me rolling, got me daydreaming about fantasy stuff. And my Fablehaven books are kind of my homage to all the mystical creatures I grew up reading about. You know what I mean? Through the course of the five books, you end up getting most of the big different kinds of creatures from a lot of the major mythologies around the world into the series in some way, from dragons to unicorns to satyrs to Greek mythology here, even Native American folklore--just lots and lots and lots of different creatures play roles in the books. Matthew Peterson: And the fourth book, Secrets of the Dragon Sanctuary, that was the last one that’s come out. You say there’s going to be five books. When’s the fifth one going to come out? Brandon Mull: Book five comes out March 23rd, 2010 and that’s the climax book of the series. That’s what will finish it off. I’m really excited about it ‘cause the series seems to, you know, it keeps on gaining momentum. It’s the kind of book where, once it gets read, it tends to spread around. And so each year it seems like we have a bigger and bigger audience, and I think they will all high five me for five. I think the people who are liking the series so far will find that five’s kind of the biggest coolest ride so far, which it kind of should be as the climax book. Matthew Peterson: Oh, good. Oh, yeah. Is there anything you can tell us about the fifth book? Brandon Mull: Well, our main characters are Kendra and Seth, brother and sister. And I’ll have them roaming further afield from Fablehaven than I ever have in the previous books. Fablehaven, itself, is a specific wildlife sanctuary. That one’s located in Connecticut, you know, for magical creatures. And over the course of book five, I’ll take them to some different sanctuaries all around the world on parallel quests. And that’s partly how I make this adventure sort of the biggest so far. Matthew Peterson: Yeah. And this is young adult. I actually have two kids that sent in some questions, George and Jack from Arizona. Matthew Peterson: And let me ask you these questions, ‘cause they were really excited to hear that I was interviewing you. #1. Which was the hardest book to write in the Fablehaven series? Brandon Mull: Probably for me the hardest book to write was book one because that was where I was sort of establishing my rules of how these preserves would function. So there were a lot of little details to figure out as I laid the ground work for the rest of the books in book one. But they all had different challenges. In general, for me, as a writer, the trickiest parts are my transitions. Trying to figure out where each scene should start, what to show, where it should stop. Those are some of the hardest choices artistically, I think. Matthew Peterson: Oh, yeah. I agree with you. I’ve experienced that same issue. I’ve talked to other authors who will just write the whole book, and then when it’s all done, then they’ll put the chapters in and section it up. Brandon Mull: Yeah, it can be hard. It can be hard to figure out what to show and what not to show. Those are tough choices. Matthew Peterson: Yeah. Next question: Will we learn if Vanessa can be trusted in the fifth book? Brandon Mull: Um . . . yes. In book five you will get answers to most of your questions about the characters. And, you know, over the course of four books, I’ve left readers with a bunch of mysteries and bunch of questions, both about individuals and about hidden sanctuaries and artifacts. I’ll tie it all together in five. We’ll kind of wrap it up and you’ll know where everybody stands by the end of the book. Matthew Peterson: One more question from the kids: It seems that Kendra has had some bad luck with relationships in the series. Frequently, when she trusts someone or likes them, they turn out to be evil. Is there a lesson that you are trying to convey or is it just bad luck on this character’s part? Brandon Mull: What Kendra’s had happen so far is largely bad luck. She’s involved with being an object of attention from a secret society called The Society of the Evening Star. And this society in the books is infamous for using deception and betrayal to accomplish their means. And so she’s been part of a few of those: two large deceptions and betrayals over the course of the first four books. People who are feeling sad for Kendra should be happy to know there is still one book left, and I think Kendra’s relationship side will end up a lot happier after book five than it did at the end of book four. Brandon Mull: Yeah, book four was probably my roughest ending so far to any of the books, and that’s partly ‘cause I feel like a book series should be kind of like a roller coaster with it’s ups and downs. And book four leaves you kind of down, but that’s partly so that book five can leave you up. Brandon Mull: Yeah, I hope so. I think they’ll like five. Rough stuff happens in five, trouble’s what makes a book good, but I think by the end of the ride of book five, they’ll be really satisfied with the journey the characters have taken. Matthew Peterson: Oh, good. Well, let me ask you one more question about Fablehaven itself. I hear that there’s been some talk about making a Fablehaven movie. What’s the latest status on that? Brandon Mull: It’s currently in development. It was initially optioned by Ari Arad, who produced like Spiderman or X-Men or Ironman. I think it’s going to move on to a different producer, and we’re in the process of pulling that together. The screenwriter who’s written a couple good screenplays already, a couple drafts, looks like he’s still on board, and we’ll probably transition over to a new production team. But we’ll see. It’s usually a long winding road for a book to become a movie and that has certainly been the case for Fablehaven. There’s still lots of interest and it still looks like it’ll probably happen, but it’s at least a few years away. Matthew Peterson: Yeah, I was just talking to Terry Brooks. [laughs] And you know, Terry Brooks, he’s sold like a hundred million books, and he’s still waiting for the movie to be made. So I totally understand. Sometimes it happens, sometimes it doesn’t. And you just cross your fingers and hold your breath and wait. Brandon Mull: Yeah, no, exactly. Matthew Peterson: Now, The Candy Shop War has also been optioned. Any news on that one for a movie? Brandon Mull: You know, that one has been moving ahead slowly as well. It was optioned by New Regency. It’s been going slower than Fablehaven. I haven’t even seen the screenplays. Matthew Peterson: Well, tell us a little bit about The Candy Shop War. Brandon Mull: Premise on Candy Shop War is: four friends discover that magicians have come to their town and have started sharing magical candy with certain kids. For example, there’s a type of candy where if you give it to an animal, for a short time you can have a conversation with that animal. They discover all the candy has different powers. But to get more candy they have to fulfill different tasks or assignments from these magicians. When those tasks get kind of shady, then the books get interesting and the kids have to figure out who’s their friends, who’s their enemies, and use some of that candy to fight back. So whereas Fablehaven is kind of fantasy out in the woods, out in these secret wildlife sanctuaries with magical creatures, Candy Shop War has more of a feel of fantasy in your neighborhood--more of a super hero kind of vibe with these magical candies giving kids powers and stuff. Brandon Mull: I hardly get complaints because of the direction the book goes basically. Brandon Mull: Yeah, yeah, yeah. Brandon Mull: There is a little bit of autobiographical content, I think, in all my books, which sounds strange, since they’re all fantasies . 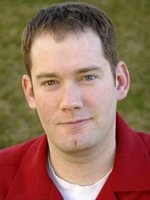 . .
Brandon Mull: I’m a dude who lived a lot in his head as a kid and who still lives a lot in his head. Brandon Mull: That’s right. Ohh. Brandon Mull: Yeah, you can very rarely see me bust a move on stage, but yeah, that Stephanie Meyer thing, I just kind of wigged out. Matthew Peterson: So you got a future in back up dancing there. Matthew Peterson: Uh, huh. So what do you have planned in the future? Brandon Mull: Fablehaven 5 will end the Fablehaven series and then I’m contracted for a three book series with Simon and Schuster called the Beyonders series. And this Beyonders series will be a three book series about a couple of kids from our world who cross over into a strange imperilled reality, this other world. So it’s my first fantasy where we’ve left our world and gone someplace else. And I’ve been working on it for like ten years. I think I’ve designed a world that will be really intriguing and interesting and I hope I’m right. Brandon Mull: And then I’ll probably write a sequel to Candy Shop War as well, which is something that’s been brewing for a few years. And because of my commitment to Fablehaven, I haven’t really had time to work it in, but I’ll try to work it in, probably within the next two years. Brandon Mull: Yeah, there’s a proud tradition of that kind of story. It goes back to Narnia and kind of stuff. Matthew Peterson: Well, it’s been great talking with you, Brandon. I’ve been speaking with Brandon Mull, New York Times bestselling young adult author of the Fablehaven series, The Candy Shop War, and Pingo. Thanks for being on the show today, Brandon. Brandon Mull: Yeah, my pleasure. Thanks for having me. Matthew Peterson: Alright, make sure you visit www.TheAuthorHour.com to listen to Brandon Mull’s bonus questions. Don’t go away. I’ve still got Maria V. Snyder and Obert Skye, coming up next.